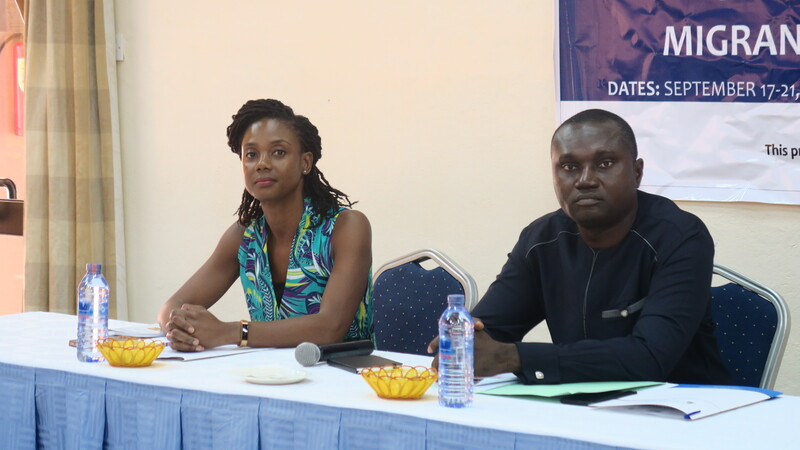 Accra – IOM, the UN Migration Agency in collaboration with the Ministry of Foreign Affairs and Regional Integration in Ghana organized a five-day training workshop on vulnerable migrants protection and on Migrants in Countries in Crisis (MICIC) initiative. The training targeted thirteen Ghanaian consular officers based in the cities of Jeddah and Riyadh (Saudi Arabia), Kuwait City (Kuwait), Lomé (Togo), Freetown (Sierra Leone), Abidjan (Côte D’Ivoire) and Ouagadougou (Burkina Faso) as well as seventeen Ministry officers. This is the first training organized for Ghanaian consular officers focusing exclusively on the protection of vulnerable migrants including victims of trafficking and unaccompanied migrant children. The objective was to strengthen the capacity of these frontline officers to respond to increasingly complex and challenging cases. The thirty participants were trained on identification, screening and referral, addressing the specific needs of children on the move and providing assistance and protection among other services. Participants were also introduced to the MICIC initiative which aims to improve the ability of States and stakeholders to better protect the lives, dignity and rights of migrants caught in countries experiencing conflicts and natural disasters. The MICIC session was facilitated by Ms. Chiara Milano, IOM Programme Officer from Geneva. “The Ministry is considering adopting the online MICIC training course for all officers in our missions abroad to serve as a useful guide in offering consular services. The objective will be to eventually build a corps of officers adequately equipped with the knowledge and skills to offer assistance and support at all times,” said Deputy Minister of Foreign Affairs and Regional Integration, Honourable Charles Wiredu. Ms. Sylvia Lopez-Ekra, IOM Ghana Chief of Mission, welcomed the renewal of commitment by both the IOM and the Ministry to collaborate in the protection of vulnerable Ghanaian migrants abroad through this training workshop. “Consular officers are often the lifeline in destination countries for distressed and vulnerable migrants,” she said. This initiative is part of a regional project on Protecting Vulnerable Migrants in West and Central Africa, funded by the Bureau of Population, Refugees, and Migration (PRM) of the United States Department of State. The project aims to reinforce the capacities of national governments in managing mixed migration and in ensuring respect of migrants’ rights in West and Central Africa.